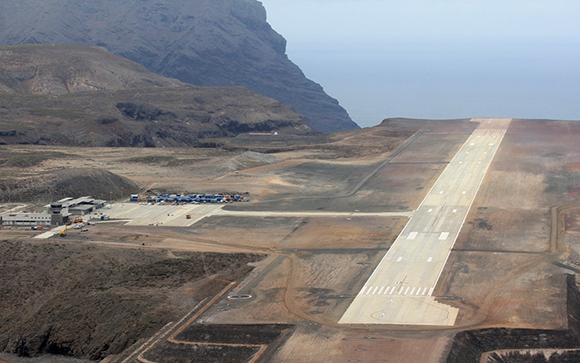 A new airport is set to open on the remote South Atlantic island of St Helena, making it the worlds newest tourism destination accessible by air. St Helena Airport is due to open in May, and its hoped that it will bring growth to the local economy through tourism and ultimately financial self-sustainability for the island. St Helena is an overseas territory of the United Kingdom situated 1,800 miles from the coast of South America. It currently takes five days to reach the island by sea (using the ship RMS St Helena) from Cape Town in South Africa, but with only one departure every three weeks, the island is one of the most remote populated places on earth, measured as travel time from major cities. The new airport  which began construction in 2012, and has been built at a cost of around £200 million  will bring to an end the isolation of an atoll best known as Napoleon Bonaparte’s final place of exile. Once airport certification is confirmed tickets will go on sale with Comair (a BA codeshare partner), who will be operating a weekly flight on Saturdays from Johannesburg, which will be serviced by a recently-delivered Boeing 737-800 aircraft.